A unique career adventure awaits! You don't know for which internship you could be the most suitable candidate, nor in which city it will take place. 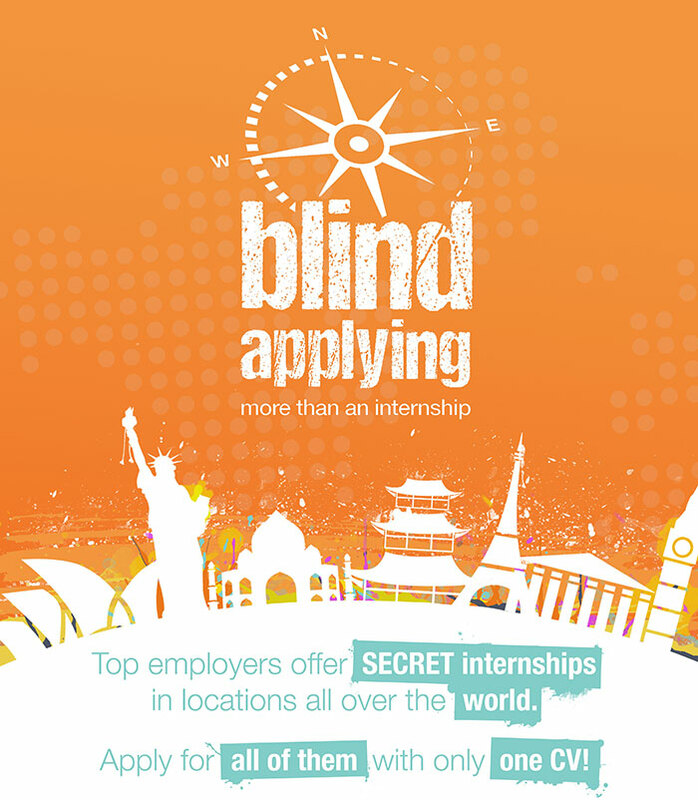 But you can be sure that if you become a Blind Applying champion, it will be an experience you will never forget! You might even find an opportunity that you have never considered before. Take the next step and jump into the adventure! … is to prepare your CV/résumé and fill in the online application form. Make sure your education and skills shine! There is absolutely no need to write a time-consuming cover letter. We just want to get to know you, your educational background and professional experiences. If we have a sound picture of your skills and interests, we can match you with one of our internships in the best possible way. What happens after you have successfully applied? Your CV/résumé is screened as soon as the application phase ends in December. The participating companies will receive a list of prospects for the internship position they offer. They can then choose the most suitable candidates and conduct interviews. Based on the performance in the interview, the Blind Applying champion is chosen and announced. Internships are scheduled for summer 2017. The exact starting date can be negotiated individually between the company and the intern. Our employers do not only consider your CV/résumé for the internship positions that are part of the Blind Applying program, but also for other career opportunities they offer. By filling out the online application form, you automatically create a free profile on Entrypark.com, our international career platform. It's an easy way to receive personalized offers for other fitting jobs, internships or programs from global top employers. October – December 2016: Application period. Simply fill out the form and submit your CV/résumé. Could your profile fit any of our secret internships? January 2017: The mystery ends. Interviews will be conducted with the best matching candidates. If you are one of them, you will know for which employer and internship you are interviewed for. All applicants should expect a final answer by February, 2017. March 2017: The Blind Applying champions are announced. Congratulations to the chosen applicants! We can guarantee a once-in-a-lifetime experience! Summer 2017: Internships begin. Check out the blog of the Blind Applying champions!